The final product: fresh from the press. People who have not yet tasted Maltese extra virgin olive oil will be able to do so tomorrow in an open day at Wardija organised by olive oil producer Sam Cremona. Maltese olive oil is held in high esteem abroad, where there is a higher demand for it than in Malta, particularly in Ireland and Switzerland, Mr Cremona said. Local production, he added, was not yet big enough to satisfy the demand from just a handful of gourmet and health food shops in European countries. Last year, Maltese olive oil was chosen among olive oils from other Mediterranean countries for a meal following an informal meeting of Ministers for Agriculture of the European Union. Olive oil produced from local olives contains negligible sulphur while it has a high content of oleuropein, a natural antibiotic. Laboratory tests have shown it has six times as much as the best olive oils. The antibiotic is produced by the tree to preserve the olive and the leaves. 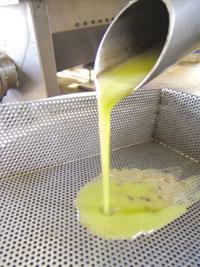 It also helps safeguard the oil and is at its highest level soon after the olives are pressed. People who come to the open day will be able to see how olives are pressed and oil is extracted, and they will be able to sample hobz biz-zejt with local olive oil. They can also take along olives to be pressed. The machine presses 100 kilos at a time, so although people can take amounts of as little as 20-30 kilos, these would have to be pressed with others. There will be some local producers selling produce such as honey, sun-dried tomatoes, olive paste and similar foodstuffs. Members of the St Peter's Foundation will also offer lampuki prepared just like fishermen used to eat them while out at sea: skinned, filleted, washed with sea water and laced with olive oil, garlic and red pepper. Visitors will be asked for a donation for the lampuki and a glass of wine. Mr Cremona first produced olive oil in 1999 from trees he had grown in his garden. He had taken the olives to be pressed in Sicily as there were no olive presses in Malta at the time, and on obtaining very good quality oil he decided to step up the operation by equipping himself for the job with an olive press he bought from Italy. Olive oil from Maltese olives was pressed in Malta for the first time in 2000 and the production has grown from strength to strength. Hundreds of olive trees have since been planted across the island and they have now begun to yield a considerable quantity of olives. Freshly pressed olive oil tastes a bit peppery but in its unadulterated form contains no preservatives, colour or other additives. Ten to 16 litres of oil are extracted from 100 kilos of olives. The yield is lower from olives harvested early in the season, when they are still green. "It would be better if people harvested the olives when they are beginning to turn black. The riper they are, the more oil they contain," Mr Cremona said. "It's important that when olives are picked, they are kept in a cool place. Shrivelled olives should not be picked or collected from the ground and olives should be as free as possible of leaves and twigs," Mr Cremona said. The open day is between 10 a.m. and 5 p.m. at Wild Roses, Triq il-Madonna tal-Abbandunati, Wardija.